I bet you thought the next post would be Part 2 of the Mute Swan post. I felt bad having to go back to the bird topic so quick after the barrage from Project Chekov so trying to ease you back onto the feathered features. Instead figured it was about time to throw out another Book Recollection. 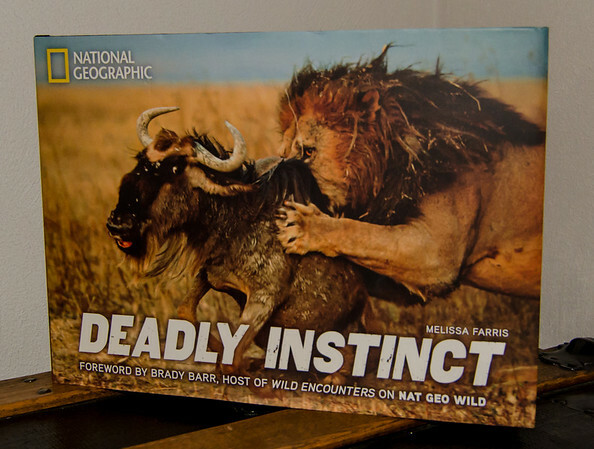 Today’s recollection comes to us thanks to Melissa Farris who compiled a product she called Deadly Instinct. I can’t remember what made me aware of this book, but my guess would be one of the wildlife photographers I follow on Google+ brought it too my attention. No need for a lot of convincing past the cover which had the National Geographic seal along with a Lion bringing down a Wildebeest – I’m in. Big thanks to Linda who ended up getting me this book for Christmas. Technically, coming in at only 180 pages, it is really more of a photography book than a reading book. There was a setup at the beginning of each chapter that set the tone for the set of images. Once that page or two was consumed, it was on to a nice collection of shots… umm let me correct that. There were some FANTASTIC shots, a lot of cool wildlife shots and then some I simply put in the TOTAL CRAP category. I’m sorry, but I like my pictures to be in focus and the attempt to show speed by throwing the shutter speed way low resulting in a blur you wouldn’t even know what it was unless they told you is not worth my time – trust me, there were more of these shots than I would have expected alongside the other quality shots. I wouldn’t let the bad shots deter you from enjoying all the good shots, but note to author – there were plenty of better shots you could have used of the Gorillas. The best part of the book was it had a number of pictures from my favorite photographer – Joel Sartore. If you recall I featured one of his books previously called Rare (link here). I had a feeling some of his work would be included based on the National Geographic stamp on the cover. Pretty used to his style these days and can usually pick out his work without seeing the credits first. Was surprised to learn he started on his naturalist journey after seeing the harsh conditions of the Galveston coast. Always cool to learn more about the background of photographer’s you spend a lot of time following. I should probably mention something before people run off to purchase this book to see the “purdy” pictures. The pictures are not all “pretty” in the hang on your wall and let your visitors gawk over mode. The truth is the intent of the book is to show how lethal, dangerous and aggressive wild animal behavior is. If you are weak of stomach or god forbid a PETA member save your money and go watch the Muppets Movie instead. This book is full of violent, bloody wildlife on wildlife encounters. Oh, and a lot snakes so Linda has been warned to never open the book herself – about 5 pages in there is a particular awesome picture of a Vine Snake that even made me hesitate when I turned to that page. Also very appreciative of the heavy paper stock she used which helps maintain the quality of the pictures. Kudos to the photographers that provided all the outstanding shots to this book. It always inspires me when I see the work of photographers that are clearly on top of their field. A pretty short recollection but the book only took me two nights of light reading before hitting the hay. Hit the jump to see my takeaways. George Shiras III introduced the first federal legislation that protected migrating birds as a Pennsylvania Congressman and discovered a species of Moose that was named after him. Looking through a camera lens, it turns out, is often much like gazing into a mirror – much to the horror I’m guessing of individuals who forget our eyes are on the front of our head and we sport bicuspids. I had no idea that wild stallions were so aggressive to each other – attacking throats, ripping ears off, biting and kicking – this is why I am not a fan of horses! We share 98% of our DNA with Chimpanzees – wonder how much of that remaining 2% is a TAIL! Remember seeing that picture of the Polar bear befriending a sled dog on the Internet.. well, they have that picture in this book along with the individual who took those pictures – just an awesome experience captured for all to enjoy. “It is relatively common, especially in the United States, to find the caduceus, with its two snakes and wings, used as a symbol of medicine instead of the correct Rod of Asclepius, with only a single snake. This usage is erroneous, popularised largely as a result of the adoption of the caduceus as its insignia by the U.S. Army Medical Corps in 1902 at the insistence of a single officer (though there are conflicting claims as to whether this was Capt. Frederick P. Reynolds or Col. John R. van Hoff). The rod of Asclepius is the dominant symbol for professional healthcare associations in the United States. One survey found that 62% of professional healthcare associations used the rod of Asclepius as their symbol. The same survey found that 76% of commercial healthcare organizations used the Caduceus symbol. The author of the study suggests the difference exists because professional associations are more likely to have a real understanding of the two symbols, whereas commercial organizations are more likely to be concerned with the visual impact a symbol will have in selling their products. I also knew the Puffer Fish was poisonous–isn’t that what people in Japan sometimes die from after they eat it? All the rest of it I didn’t know, so thanks! The 98% of shared DNA never impressed me. First, they would say that 95% of our DNA is junk, something else I never believed for a second and which is apparently being overthrown big-time (and it turns out there are ALSO many many many more expressions of DNA, sort of second order ones that control genes, that they just found). But back to conventional wisdom: 98% shared, but 95% junk. If this were true, I bet the 2% that is different is NOT junk, and therefore 40% of all the non-junk DNA is different. Which is huge, although I don’t believe it’s that big, either. The whole thing is bogus. See http://themindunleashed.org/2014/01/scientists-finally-admit-second-secret-dna-code-controls-genes.html . Why is the reintroduction of wolves resulting in the revival of cottonwoods? The wolves are eating elk or moose that would nibble on the cottonwoods? Thanks for the post! As I tell everyone, I’ve always loved to read book reviews and I read as many as I can. You learn a whole lot from them, you get the latest information available, and with a knowledgeable reviewer you get perspective as well. So this was great! Wow, the mega comment! So it seems there is a rift between the medical and commercial community – guessing this is a similar argument between say the shake weight vs the health community and we all know the shake weight is the most awesome training device ever invented regardless of those medical professions who obviously is so incompetent they use the wrong symbol… I think the government should step in and do a survey of all health professional board rooms and correct them whenever they try an obvious attempt to pull the wool over the people who love the shake weight.. just saying if the FCC is going to come up with stupid ideas they might as well go all the way. I see my education on the puffer fish is deficient. I just like watching them puff in puff out puff in puff out puff in – could watch that all day .. but now that I now they can KILL me they aren’t so cute – damn you animal gods and your sneaky defense tricks. Not so sure if it is the fault of the puffer fish killing the Japanese people as it is they like RAW fish! Anything beyond that death wish is just candles on the coffin. Hey, joking aside thanks for the insights – alway a plus when I learn something!